When people start complaining that their page posts are not getting enough engagement, I just take my phone, search their business name on Facebook and start analyzing their latest posts. In such cases, I start explaining to people that users really don’t like seeing such kinds of posts because their feed is already filled with so many ads, that advertisers put on Facebook for promoting their products or services. Promotional content isn’t something, that will engage your customers and make them hit the “Like” or “Share” buttons. It’s something, that will make them scroll down through their news feed or even browse your page and unlike it. And the reason why so many pages on Facebook fail, is the fact, that we want to get value from someone without giving it. Not fair, is it? Promotional/sales oriented content isn’t valuable in most cases. The good thing is you can promote your product or service and at the same time provide valuable content for your audience. They love to hear your company story more than what you are trying to sell to them. So, get rid of the promotional material from your page. Instead, start educating them with valuable and entertaining content. Renderforest reports, that 86% of marketers are satisfied with their video marketing results and consider them successful. This means that you can use lots of videos in your content marketing strategy and have success in it. What about starting to produce videos right away? Of course, I agree that lots of small businesses might not have budgets for Facebook. But well, if you’ve started a company, then you should have at least $100 for testing Facebook ads. And you may want to read carefully as I’m going to tell you an easy trick on the next line for not wasting that $100 on Facebook ads. Let’s split the $100 into two $50. What’s your business about? Do a little research or analyze what ads your competitors currently run, if you can’t come up with an idea. Think of that content and create content for two ad campaigns. Once you’re finished, start running the promotion at least for a week for each campaign. Seems easy, right? Wait, you’re not done. Instead of sitting and smoking a cigar, while your ads run, start analyzing how they perform. After your ad has been in the process of running for several hours, you may start optimizing it. By optimizing and measuring your ads every 24 hours, you can at least get your invested money back after the campaign ends. You can do this several times while you find out which ad type works the best for your product or service. And this whole idea means that you don’t have to invest thousands of dollars to start Facebook ads. All you need to kick off is $100. And here comes a question. How to start conducting webinars? Well, the first step is to choose a topic, that can bring value to your audience. These are really basic ideas that you can start with, and then you can make your webinars a big part of your digital marketing strategies. After deciding what topic to choose, you have to think about the environment and the time you are going to shoot it. Be sure to make everything in high quality: Setup lights, camera, and voice. There are lots of tools, which will help you stream your webinar in a professional way on your Facebook page. After setting all these things up, it’s time to go and create an event for your webinar. Write an engaging description, pick an eye-catching title, create a beautiful cover pic or cover video for your event. Don’t forget to choose the right time. You have to understand your audiences’ timezone and pick a time that will be convenient for them to participate in your webinar. 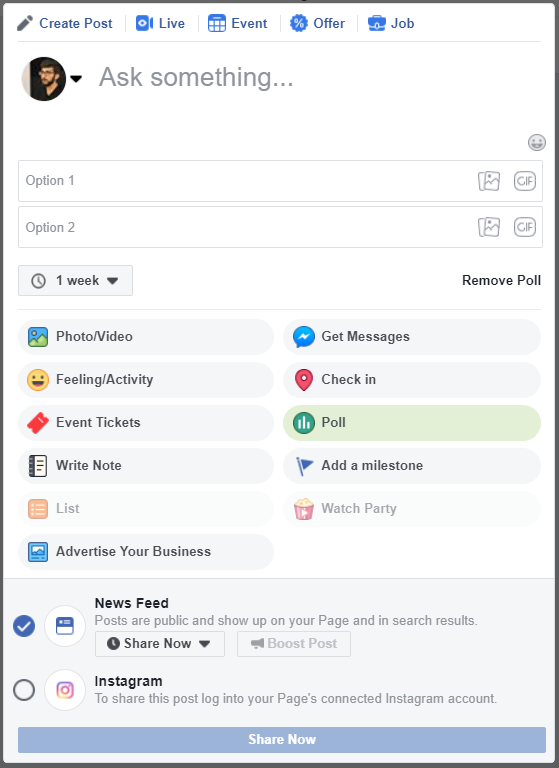 Facebook gives you the opportunity to create polls with texts, photos or GIFs. You can publish them in your story or news feed. They’re a really cool way to increase your page engagement rate. This list can last long. I just want to give you the idea of how you can use the community for making a stronger emotional connection with your brand. It will also help you to get your brand name more popular on Facebook. We have to realize that people who live in the 21st century, don’t like to wait even a minute more. They want their issues to be solved ASAP. If you can’t give the best experience to your users, then the chances are high that you’ll lose your customers. Just be with your customer whenever they need you. You can set an auto-reply for any recommendation you’ll get for your product. If it’s a positive recommendation and your customer is happy, thank him/her and tell them something awesome. If the recommendation was negative, don’t mess up. You have to find out the reason why the customer is angry with you and left a negative review on your page. When getting negative feedback for your company, you must dig very deep for finding out the real reason why your customer isn’t satisfied. Maybe someone from your employees did something bad to him/her? You should know about it. Even if it is the worst feedback about your company (in a professional way), don’t remove or ignore it. If someone else comes and sees bad and unanswered feedback from someone, that can hurt your business a lot. Also, you can’t remove negative feedback, so you have to answer as clear as possible, for not negatively impressing others. You can use the Facebook “pages to watch” report and add your competitors there. What about the ads they are running? You can see that information publicly by checking their ads and info section. By doing this, you’ll know where and how your competitors target their ads. And it can give you lots of ideas for your next marketing campaigns. If you do this analysis twice per month, it will be complete enough for knowing everything about your competitors.